Foursquare is DOWN… quick… call my sponsor! by Danielle Ricks.In Foursquare, Social Networking, Twitter. I’m going about my daily work day which starts with me checking in on Foursquare at Union Station. I am determined to steal the mayorship from that guy at Union Station. I am there two times a day… five days a week… HOW am I not the mayor yet? That’s OK, one day he will forget to check in and when he does… BAM… the mayorship is mine. Sorry, I digress… I often go “off the grid” on Foursquare over the weekend but I’m always checking in during the work week. Yet, to my surprise, there was no Fourquare to check into this morning. Then the tweets started flying, tweeple wanted to know “is it me”, “is there something wrong”? 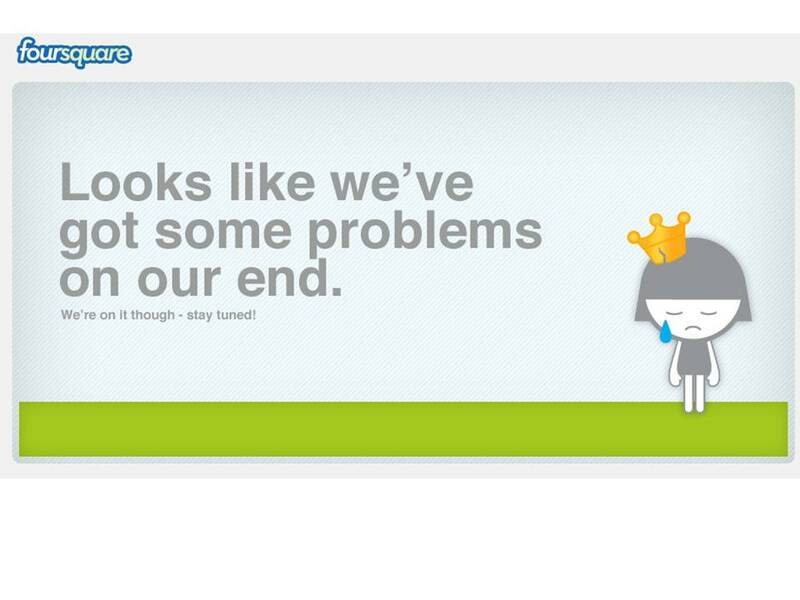 As it turns out Foursquare is having major technical problems. I didn’t know the extent of the problem this morning and I was prepared to go to the website and give them a piece of my mind when I was met by the graphic below. The poor little icon has a broken crown and the saddest face. How can I be mad at that? OK, graphic designers, you got me… that’s a good look… I’ll just wait for you all to get the problem under control. In the meantime, I’m able to better manage my Foursquare addiction and that can be nothing but a good thing! Next Next post: What type are you… no… what FONT type are you?